It’s been a bizarre twist of events for Assassin’s Creed. The first game, which came out November 2007, managed to build an almost unprecedented amount of hype around it – yet there was barely any information ever released by Ubisoft until the last minute. The previews, the footage – none of that came until pretty late in the day and the game gained much of its popularity on word of mouth and hopeful hype. That’s not been the case for Assassin’s Creed 2 though and, now that the cat’s out of the bag, it seems we can’t go a few days without seeing another new Assassin’t Creed 2 trailer being released and showing more grisly and stylish murders. Was he pushed or did he fall? It’s a far cry from the marketing for the first game, which put more attention on producer Jade Raymond than on the details of the plot – but then, Ubisoft has a lot to prove with Assassin’s Creed 2. The complaints about the repetitiveness and meandering story of the first game have got to be addressed if Ubisoft hopes to keep fans interested enough to follow the trilogy through to its conclusion. Oh, and we’re tempted to launch into a big diatribe about trilogies and how nearly every game these days is being planned as part of one, but we won’t go into that. Instead, we’ll stick to the original topic and talk about how Assassin’s Creed 2 is trying to tell a more interesting story than that of the first game – one of a sympathetic character out for revenge, not an arrogant brat out to win his master’s favour once more. Replacing the annoying Altair this time around is the more stylish and less aggravating Ezio, a descendant of Altair and Desmond who brings the game into a only-slightly-more-modern 15th Century setting and relocates the series away from the Crusades and towards Renaissance Italy. For those of you who aren’t too up on your history, it’s probably better to just refer to it as The Time of Da Vinci – who appears as a supporting character that supplies Ezio with the weaponry and gadgets to accomplish his brutal work. 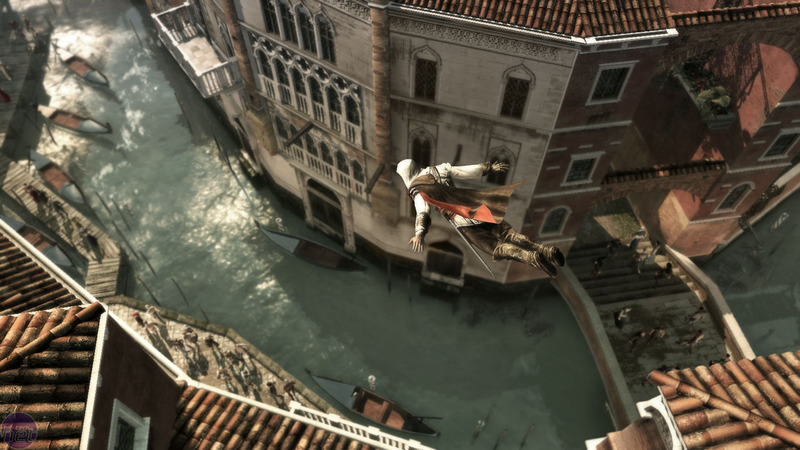 What helps further separate Ezio from Altair is the fact that he has a clear motive for signing up as an assassin; revenge. 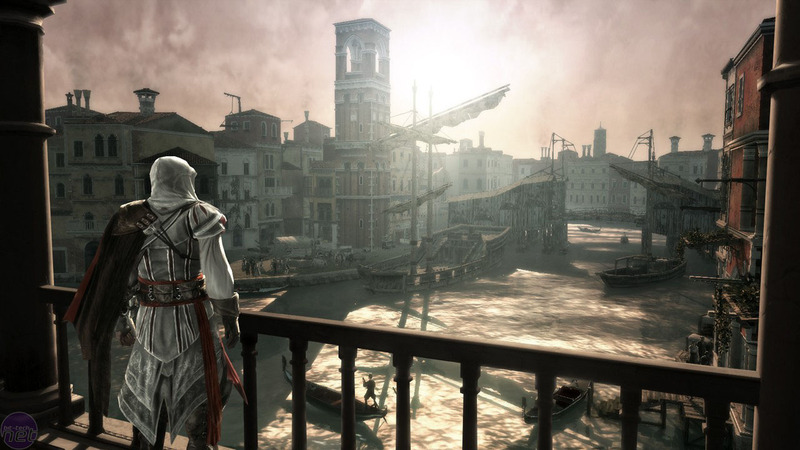 After watching his father be wrongfully executed, Ezio becomes a murderer for hire as part of a plot to get close to those responsible and bring them to justice. That’s the general gist of half the story anyway, with Assassin’s Creed 2 also continuing the adventures of Ezio’s modern ancestor, Desmond. Still held captive by the mysterious Abstergo corporation, Desmond was trained to be an assassin from a young age but escaped from the compound and tried to live a normal life until his capture. Abstergo are still using the Animus machine to explore his genetic memory and further their malevolent goals, so in between recollections we can expect to spend plenty of time exploring the sterile laboratories of Abstergo and getting some more time with Kristin Bell. That’s never a bad thing – and possibly a reason to try the game out on its own. While we can’t honestly say we’re thrilled that the game will continue to explore the story from two perspectives again, Ubisoft is promising that much more of the plot will be dealt with this time and that the Desmond sections of the game will be more than just boring, barely interactive cutscenes. No reason given for parting of ways. Set in the US Revolution, does Assassin's Creed offer anything new this time around? Is the new Assassin's Creed a genuine revelation, or a revolution over old ground?